Fyne Futures believe that we have a responsibility to care for and protect the environment in which we operate. We are fully committed to improving environmental performance across all of our business activities, and will encourage our business partners and members of the wider community to join us in this effort. 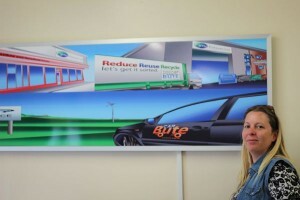 We are reducing our energy use (and costs) with innovative infrared heating panels. We will be publishing results later in the year. Nicky Jones, local artist, is picture here with one of the new panels which features her beautiful design work for our carbon busting services.